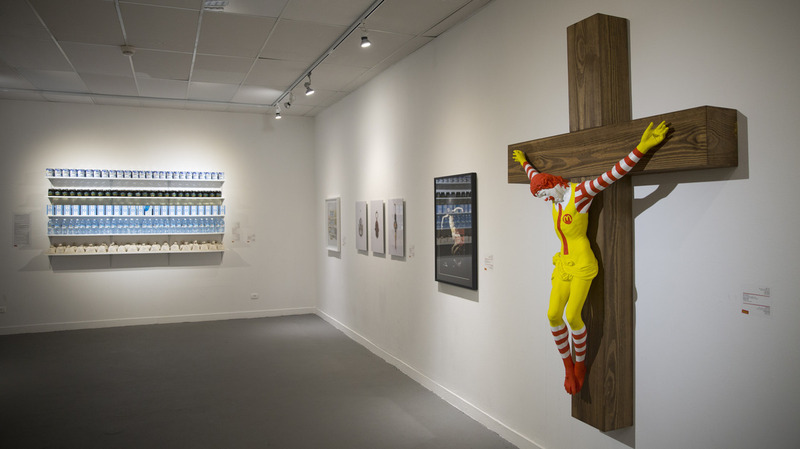 'McJesus' Sculpture To Be Pulled From Israeli Museum After Violent Protests Jani Leinonen's artwork, which depicts Ronald McDonald slumped on the cross, drew the ire of local Christians. Now, the piece is getting taken down — just as the artist himself had requested. The sculpture, known as McJesus, was created by Finnish artist Jani Leinonen and displayed as part of the Haifa Museum of Art's "Sacred Goods" exhibition in Israel. The piece, seen on display in the museum Monday, prompted vehement pushback from Christians in the country. Less than a week after hundreds of Christian protesters descended on the Haifa Museum of Art, clashing with police in a demonstration against a controversial sculpture, the Israeli city's mayor says the object of their outrage is getting withdrawn. 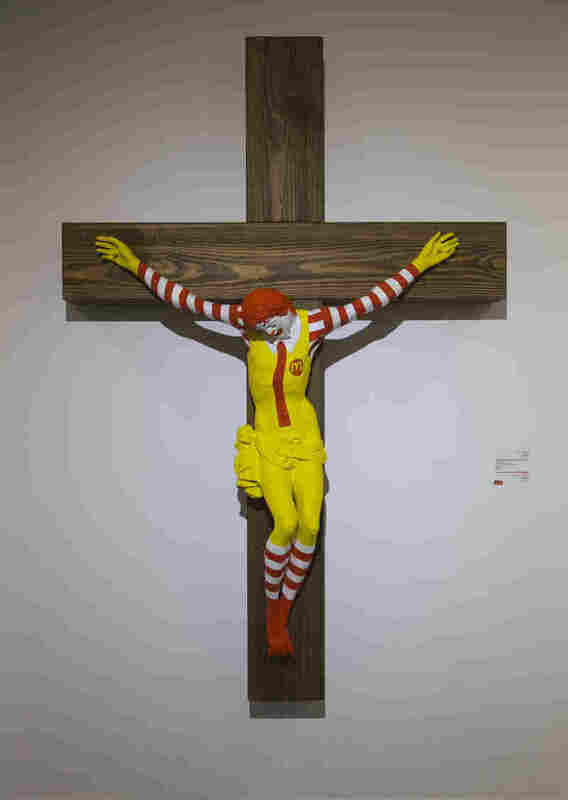 Einat Kalisch-Rotem announced Wednesday that McJesus, a work of art depicting a crucified Ronald McDonald, "will be removed and returned as soon as possible." "Without any connection, we believe in freedom of speech as a cornerstone of democracy," she wrote on Twitter, according to a translation by The Times of Israel. "We regret the distress experienced by the Christian community in Haifa, and the physical injury and violence that followed," Kalisch-Rotem added, referring to the bloodshed that left three police officers injured last Friday. "We thank the heads of the Christian churches and priests in Haifa for the dialogue and desire to bridge, the effort to reach a solution, and to prevent violence." 2. ללא כל קשר, אנו מאמינים בחופש הביטוי כחלק מאבני היסוד של הדמוקרטיה. צר לנו על עוגמת הנפש שחוותה הקהילה הנוצרית בחיפה, ועל הפגיעה הפיזית והאלימות שהתרחשו בעקבותיה. אנו מודים לראשי הכנסיות וכוהני הדת הנוצרית בחיפה על ההדברות והרצון לגשר, המאמץ להגיע פתרון, ולמנוע אלימות. The sculpture, created by Finnish artist Jani Leinonen, has stood on display since August as part of the museum's Sacred Goods exhibition. There it stood largely without incident for some five months, with its luridly colorful fast-food mascot nailed to the cross, slumped in an attitude recalling Jesus Christ. 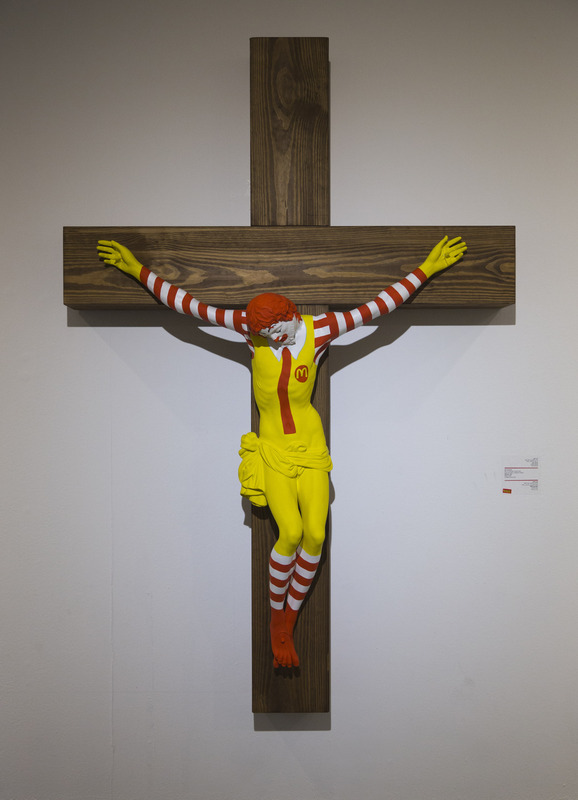 Jani Leinonen's McJesus, seen here Monday in Haifa, elicited a forceful pushback from local Christians. This week the mayor of the Israeli city, Einat Kalisch-Rotem, announced that the sculpture would be removed from the Haifa Museum of Art. Elsewhere in the exhibition were plastic action figures of Jesus, packaged to look like Ken dolls, and a print of the Christian messiah with arms outstretched — only this time holding up shopping bags. "In the contemporary context, the artists participating in the exhibition employ religious symbols to criticize the encroachment of the consumer culture on our lives in general, and on the religious sphere in particular," the exhibition's organizers explained on the museum website. "The artists also criticize the way religions use consumer values and practices in order to prosper in the contemporary reality." Many among Israel's Arab Christian minority didn't appreciate Leinonen's nod to their religious iconography, however. And last Friday, their simmering discontent erupted into violence, as protesters sought to storm the museum, allegedly tossing stones and even a couple of firebombs before being dispersed, according to Haifa law enforcement. Israeli media caught video of the chaotic scene. Israeli Culture Minister Miri Regev, too, recently called for the sculpture's removal, though her request was reportedly rebuffed by the country's deputy attorney general. It was already scheduled to be returned to the Finnish museum that the Israeli curators had loaned it from, but Kalisch-Rotem suggested that the process will now be expedited "in agreement with church leaders." Ironically, the news is likely to cheer not just the Christian protesters, but the very artist whose work they were protesting. Leinonen himself had demanded that McJesus be taken down — though for very different reasons. "I joined the Boycott, Divestment and Sanctions (BDS) movement, that upholds the simple principle that Palestinians are entitled to the same rights as the rest of humanity," he told The Jerusalem Post on Sunday. "Israel overtly uses culture as a form of propaganda to whitewash or justify its regime of occupation, settler-colonialism and apartheid over the Palestinian people," he continued. "Therefore I do not wish to be part of this exhibition and I asked the museum to take my artwork off the exhibition." He explained that he had asked for his piece's removal even before the violent protests, and when he heard of them, he repeated his demand: "I insist my work will be taken off the exhibition instantly." Now, it appears he's finally getting his wish — but not everyone was pleased with the decision. Kalisch-Rotem's announcement represents a "capitulation to violence and severe damage to artistic freedom of expression," Dan Yakir, chief counsel for the Association for Civil Rights in Israel, told the Israeli publication Haaretz. "The mayor, like the culture minister, is not authorized to decide what is or isn't displayed at the city museum."